Kanji in Context-A Study System for Intermediate and Advanced Learners has been designed to allow learners who have completed a beginning course or are currently studying at the intermediate or advanced level to systematically and efficiently build on the foundation of kanji and vocabulary that they have previously acquired, so that upon completion they will have an understanding all of the 2,136 kanji designated for common use by the Japanese Ministry of Education. This text is divided into two parts, a main book and a 2-volume workbook. 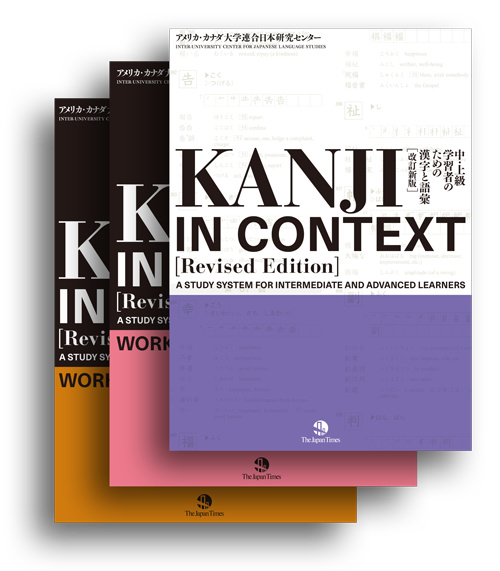 Kanji in Context was written with the needs of intermediate and advanced learners of Japanese in mind, and the content is presented in a manner that facilitates progress in stages, enabling learners to understand all the everyday use kanji. As a text specifically for intermediate and advanced students, Kanji in Context does not place the emphasis on learning the basic forms of kanji, as is necessary at the elementary stage of Japanese language study. Rather, it takes a proactive approach to introduction of intermediate- and advanced-level language, focusing on readings of kanji and examples of their usage, even when presenting characters that should have been learned at the elementary level. Instead of proceeding by simply adding more and more characters to be learned, we make clear in this text that the ultimate objective is to understand all of the everyday use kanji, and we present specific sequential steps for the attainment of that goal. The term “everyday use kanji ” refers to the table of characters that was established by the Ministry of Education, Culture, Sports, Science, and Technology, as revised in 2010; these are the characters that are considered standard for writing the Japanese language that is used today in official documents, newspapers, magazines, books, and other media that employ writing. Mastering these everyday use kanji is the goal of the education provided in schools for native speakers of Japanese, as well, and it can be said that achieving mastery is acquiring a power equivalent to that possessed by educated native speakers. If one has an understanding of all the everyday use kanji, one becomes able to infer the readings and the meanings of nearly all of the kanji that appear in Japanese writing. In Kanji in Context, we have set mastery of all the everyday use kanji as the final goal-a goal we believe is appropriate for intermediate- and advanced-level students-and we lay out a concrete program for achievement of that goal. At the intermediate level and above, the number of kanji needed by learners rises sharply. In order to effectively meet this growing need, it is not adequate to learn each new character randomly; rather, it is also necessary to study the systematic connections that lie behind kanji and kanji -based vocabulary. In general, there are three basic elements to kanji: form, sound, and meaning. Form refers to the principles behind the structure of kanji (the components and their positions within a character); sound to the shared connections and similarities in the readings of particular kanji, as based on their components; and meaning to the underlying system of meaning in kanji, as based on their components. These three elements are organically intertwined within the kanji, and a proper knowledge of them will not only bring a dramatic increase in the speed at which new kanji and vocabulary are digested, but will also foster the ability to infer the meaning and reading of previously unencountered kanji vocabulary. If one learns kanji simply by studying them one by one in the order of frequency with which they are used, it becomes an exercise in learning individual characters. Connections between kanji are ignored, and it is difficult to understand that kanji belong to a system. In this main volume of Kanji in Context, the order of presentation of characters has been arranged to facilitate learners' natural acquisition of information about the system of form, sound, and meaning of those characters. In addition to the acquisition of new kanji, it is also important for intermediate and advanced learners to learn new vocabulary words that incorporate those kanji and the correct usage of those words. However, traditional kanji textbooks have focused excessively on the study of characters one by one, providing only a sprinkling of vocabulary words, which, more often than not, have little practical use for learners. In contrast, this text goes beyond mere study of kanji to include the acquisition of vocabulary as one of its objectives. Thus the main book contains an abundant collection of essential vocabulary words, all of which have been selected with the different stages of learning in mind. Moreover, the usage of the vocabulary in the main book can be learned in context through the example sentences and related words in both volumes of the workbook. In the majority of kanji textbooks, each kanji or word is presented only once, an approach based on the assumption that it will be fully mastered at the time it appears. However, a single presentation does not guarantee that the character or word will be effectively acquired by the learner. For this reason, the same target vocabulary and related words are repeatedly presented in Kanji in Context, and the frequent contact with a particular kanji or word reinforces its acquisition. At the same time, to the extent we could, we have limited the presentation of items that have not been previously studied, and in instances when it has been necessary to present such items, we have made an effort to keep the burden on the learner as light as possible. For example, in the workbook, we have added furigana to words and kanji that have not previously been studied. Also, in the exercises in the workbook, we have as a rule not included words that incorporate previously unstudied kanji. Gaining an understanding of basic words and the system of everyday use kanji, and then at the next stage expanding vocabulary while reviewing the basic words, students will be able to make orderly progress through these textbooks, with each stage building upon the previous stage. Fully memorize the forms of the kanji that are studied and the meaning and reading of the key words (words printed in red) in the main book and the kanji from which they are composed. This study gives you a fundamental knowledge of the kanji. Go over the vocabulary listed for each entry in the main book to learn the meaning and usage of the kanji. Further, when you are advancing your learning by at first confining yourself only to key words (printed in red), there is no need at this time to memorize the words that are not printed in red. Study the way kanji words that you learned, and study the way they are used and related words in the workbook. When you are focusing on key words (printed in red) only, study just the items that are marked by white numbers printed within black circles. Words printed in bold type are key vocabulary words, and you should make certain you memorize their meanings, their readings, and the way in which they are used. If you do not understand something, please go back to the main book and learn it. Double-check to make certain that you have learned the key vocabulary words. Having your Japanese teacher or a friend make simple quizzes for you or making flashcards are among the effective ways to review. Another way that is useful for confirming your mastery is to try to create your own sentences containing the words in the workbook. Continuing systematically to follow these four steps, go through the workbook until you have completed all 156 units. When you finish, you will have approximately 3,700 key words in your vocabulary. By mastering all of these, you will be able to read, or at least to infer the meanings and readings of, the vast majority of the kanji that appear in everyday Japanese written materials such as newspapers and magazines. In Stage II, you will be expanding and strengthening your stock of vocabulary words that incorporate the kanji you have learned. Go back to Unit 1 of the main book, and as you review key vocabulary words, follow the four steps described in Stage I, above, to gain mastery of the unmarked words (that is, the words that are not marked with the symbols ◇, 「歴」 or 「特」). When you reach Stage II you will have already learned all of the Joyo Kanji, and at this stage you should also study the words in this book that contain characters you have not previously learned, which we have marked with an asterisk (＊). Please note that because not all these unmarked words are treated in the workbook, we have limited the list of such words by selecting words that are important to know but somewhat difficult to use. Although the number of such words is larger than the number of key vocabulary words, you will find that you master them faster than the key vocabulary words because you have already acquired knowledge of the forms and readings of the Joyo Kanji. Continuing to follow this procedure, go through the main book until you have completed all 156 units. In the third and final stage, you will begin again at Unit 1 and learn the words marked with the symbols ◇, 「歴」 and 「特」. These words are considered to have relatively low importance, and generally they are not treated in the workbook (exceptionally, a few words marked ◇ do appear in the workbook). It will be sufficient for you to check the main book and to learn these words as needed to deal with the materials you choose to read. Please be aware, however, that if you wish to attain total mastery of 100% of the readings of Joyo Kanji, you will need to be able to read all of these words. Mastering kanji is a very important key to the smooth transition from the beginner's level of Japanese to the advanced level. This material, which consists of the [Reference Book] and [Workbook Vols.1 & 2], is designed to enable students to systematically and efficiently learn kanji and kanji-based vocabulary indispensable to Japanese communication. 1,947 kanji-all the standardized kanji (Jooyoo kanji) and more-are divided into six levels according to what stage of Japanese you are at. The kanji entries are arranged in order of importance and other factors are taken into account such as difficulty and connections in form and meaning so that students can learn kanji as effectively as possible. This material focuses not only on the study of each kanji but also on the vocabulary in which they are found. There are approximately 8,000 words included, carefully selected to meet the needs and interests of adult students of Japanese. [Workbook (Vols.1 & 2)] accompanying this book contains important information on the usage of the vocabulary in the [Reference Book], including useful phrases. related words and sentence examples. Writing Letters in Japanese has been created to serve as guide for foreign students of Japanese who wish to write letters as part of their day-to-day experience in Japan. This book provides the necessary information for letter writing as well as models of letters written for various situations that foreigners are likely to encounter in Japan. The first section of this book, "Fundamentals," explains the basics of writing letters in Japanese, such as the social concepts behind letter writing, letter format, seasonal greetings and other fixed expressions. The second section, "Application," contains over 70 examples of such letters as greetings, requests, thank-you letters, invitations, personal news and letters regarding employment. These letters not only provide models for different purposes of writing, but also show the various levels of formality and how they change depending on the nature of the relationship between the writer and the addressee. In order for students to easily apply these letters to their own situations, each example has guide marks representing levels of formality as well as additional notes on word usage and the etiquette and traditions surrounding letter writing. By following the instruction of letter writing and modeling his or her letters on the examples, students will be able to write letters like those written by educated native speakers of Japanese. Originally designed as a textbook for intermediate and advanced students at the Center, this textbook has been repeatedly updated and revised to meet the everchanging needs of students. It is often difficult for non-native speakers to interact properly in Japanese society, but many of the problems arise not from language use, but because many of the commonly taught "sterile" patterns can, when used out of context, lead to misunderstanding and even stronger emotions when used in the real world of Japan's society. This book not only introduces the Japanese language as spoken by millions, but also serves as a guide to the varying levels of formality within Japanese society that are reflected in the Japanese language. The better your Japanese becomes, the more those around you expect you to act as though you were Japanese, thus constantly adjusting your level of diction and speech patterns as social status, intimacy, and context require. Through its twelve units, the text guides students to the level of competency necessary for communication within Japan's complex society, filling the void left by more traditional advanced-level texts. An Introduction to Advanced Spoken Japanese is designed as a review text for students of Japanese who have completed two years of college-level instruction in the language or the equivalent. The text has emerged from years of using and improving Basic Japanese - A Review Text at the Inter-University Center, and from extensive study and reflection about how students can be helped to speak Japanese correctly and fluently in the shortest time possible. Since the principal objective of the volume is to assist you in achieving proficiency in spoken Japanese, each of the sixteen lessons is focused on a situation usually faced by a foreign student living and studying in Japan. Every lesson opens with a Japanese conversation between a foreign student and one or more persons, contains examples and drills in conversation form, and introduces crucially important words and phrases for that particular situation. Since accurate speech is possible only when grammatical constructions are understood and used correctly, each lesson lists - on the first page for that lesson - the grammatical forms to be reviewed. These forms are embedded in the conversations and drills of that lesson, permitting you to practice them in various settings. The objective of Integrated Spoken Japanese is to provide drill materials for approximately five hundred patterns, usages, and constructions of spoken Japanese at a level beyond the basic patterns of beginning Japanese. The text has been used in the Inter-University Center intensive advanced Japanese program following the introductory Intermediate Spoken Japanese Center text. The twelve lessons of ISJ, all of which have the same basic layout and utilize the same procedures, are normally covered in a period of eight to twelve weeks (120-180 classroom hours), depending upon the initial level of each section of students. Integrated Spoken Japanese assumes a level of spoken language ability equivalent to the completion of the standard beginning spoken Japanese language texts currently in use in American and Canadian university programs. The text also assumes that the student will have a basic knowledge of kanji (minimumly the 881 kyoiku kanji). In order to make the text readily usable by students with a low level of kanji knowledge, however kanji readings in furigana are provided throughout the entire text (with the exception of the honbun, kaiwa-bun, and oyo kaiwa-bun passages, for which complete English vocabulary lists are provided).